Answer: Today I'd like to discuss soil mixes for terrariums. TL:DR Answer: I recommend a 50/50 potting soil and sand mix for terrariums. If you are using a larger terrarium vessel like an aquarium, you may want to increase the ratio of soil you mix into your substrate. This will ensure your larger plants get more nutrients as time goes on. 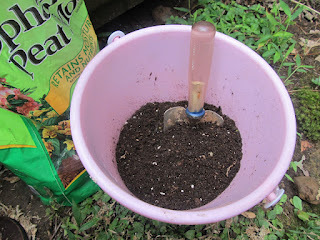 "Mix one part potting mix with one part sand to ensure proper drainage. Add distilled water to make damp but it is easier to transfer to terrarium when it is dry. Remember - you can always add more water to your final terrarium but it is difficult to remove! You should have enough soil to fill about 1/4 to 1/3 of your terrarium container. I would recommend using about 1/2 of the portion you have set aside for your terrarium and then adding the rest after you have planted your largest terrarium plants. Add the soil by scooping spoonfuls into your paper cone and tamping down with a skewer. Once you have layered your dirt into the terrarium you'll want to mist down the soil. Soil will need to remain damp throughout the life of your terrarium to support your plant growth." According to Wikipedia, "The most important property of peat is retaining moisture in soil when it is dry and yet preventing the excess of water from killing roots when it is wet." That doesn't sound inherently bad for a terrarium, but the part about retaining moisture in the soil makes me hesitant of its application to terrarium life. Yes, plants like moss and ferns need a lot of moisture. However, a healthy terrarium has an interior water cycle; water moves through the soil, evaporates into condensation on the sides of the vessel, which again spill down into the soil in a cycle. Has anyone had good luck using peat or sphagnum soil mix in terrariums?